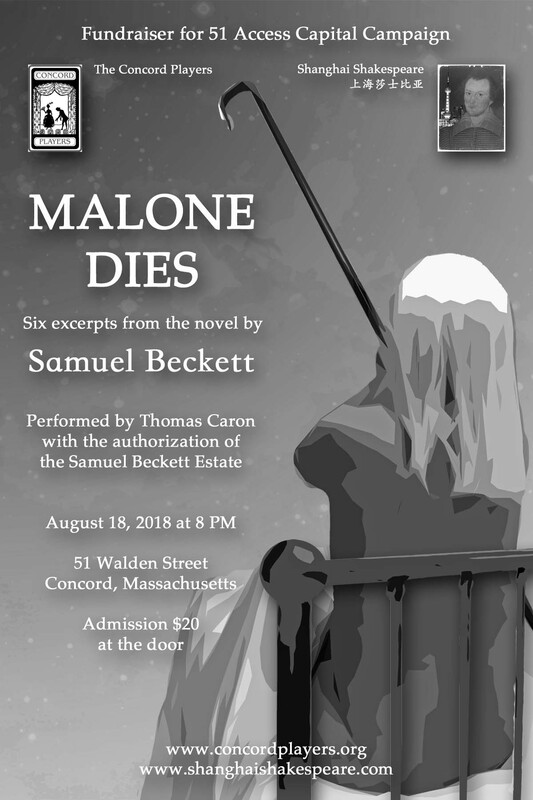 Thomas Caron, the founder and artistic director of Shanghai Shakespeare, will perform the theatrical adaptation of Samuel Beckett’s novel, “Malone Dies,” in its American debut at 51 Walden, Concord at 8 pm on August 18th. He received his training at the hands of the 20th century’s legendary teachers Sanford Meisner, Harold Clurman, and Robert Lewis. His career extends over fifty years, on stages from Los Angeles to New York to the U.K. to China. He has performed the title roles of "Hamlet," "Macbeth," "King Lear," "Timon of Athens," "Richard the Second," "King John," and "The Misanthrope," as well as Leontes in "The Winter's Tale," Cassius in "Julius Caesar," Angelo in "Measure for Measure," Prospero in "The Tempest," Constantine in "The Seagull," The Cardinal in Jean Cocteau's "Bacchus," M in Samuel Beckett's "Play," and many other classical and contemporary characters. Portions of “Malone Dies” had been incorporated in stage adaptations of Beckett’s prose before, most notably by Beckett favorite Jack MacGowran. British comedian Max Wall read passages from “Malone Dies” as part of his stand-up act. In 2007 Caron relocated from Massachusetts to Shanghai, where he formed the first Mandarin speaking Shakespearean theater troupe, Shanghai Shakespeare. But the urge to adapt and stage “Malone Dies” never left him. Two years ago, with the publication of the third volume of Beckett’s letters, he found the solution he had so long sought. In 1958, Beckett himself had selected six passages from “Malone Dies” for actor Patrick Magee to read on the radio. He contacted the Beckett Estate and applied for permission to perform them on stage. On the condition that he would make no changes to the text of nearly 10,000 words, he not only received the Estate’s permission, but its blessing as well. Malone, elderly and impotent, confined to a bed in a private room, prepares for his passing by telling himself stories and reflecting on his life. On August 18, 2018, at 8 pm, at 51 Walden St., Concord, Massachusetts, “Malone Dies” will have its U.S. premiere at the Concord Players, America’s oldest continually operating community theater. As part of the year-long fund raising effort in the Access 51 Capital Campaign, tickets will be $20 at the door. **Please note that parts of our lobby (including the handicapped-accessible restroom), will be under construction, to upgrade our facilities in accordance with the Access51 campaign.